Two more Bonus sketchbook pages to go! 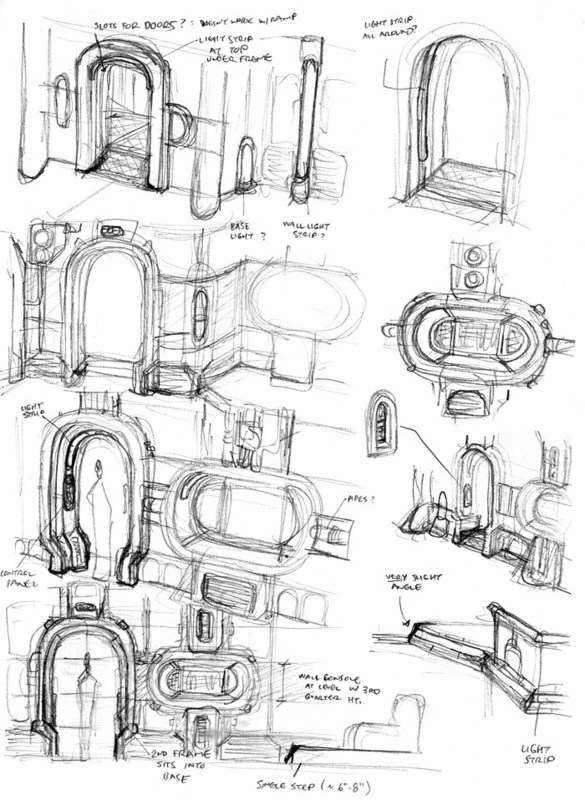 Here we have a few concept sketches for the interior of the Khoruysa Brimia. I did a few Bonus pages a while back about the Art Tweaks I did to the ship interior. Basically, the original designs were a bit too plain and visually uninteresting. They also didn’t have much of a sci-fi feel to them. So I went back and did a second pass on the interiors, trying to come up with something better, while still being mindful of not making it overly complicated and detailed, since I knew I’d be drawing it repeatedly going forward. One thing you’ll notice is the recurring theme of the elongated oval shape, which is basically a rectangle with rounded ends. I wanted that shape throughout the interior of the Brimia as a visual callback to the ship’s exterior, where the main part of the ship, the cargo hold, has the same shape.